As one year draws to a close and we gear up for a shiny, brand new year it’s always nice to look back and celebrate what’s gone on in the previous 12 months. And what a year 2018 was for the Comms Unplugged community. Sit back and reminisce with us as we count off some of the highlights of our unplugged year, month by month. If you’ve been a part of the journey with us, we love ya! And if you’re thinking you’d like to get on board for 2019, maybe there’s something here that’ll make you run along the platform and jump on the train! The happiest of New Years to all of you – here’s to growing our epic community in the coming year. January: We started the year on a high as we’d earned a Highly Commended in the 2017 Unawards. And at that prestigious event we met the excellent Adrian Stirrup who recorded our crazed ramblings about #CU17 and featured us on his Talking Comms podcast for the new year. We resolved there and that that we wanted Adrian to join us in the field for 2018 and our pursuit began! March: Our ace partners Alive with Ideas helped update our website and brand and we launched ticket sales – yay!! Even before they knew what was on the programme, some of our loyal original unpluggers were bagging their tickets! We started to announce speakers, including the fantastic Sam Hodges, then Head of Comms at Twitter UK. What a coup to get him in the field! And this month we also hit 1,000 followers – very exciting! 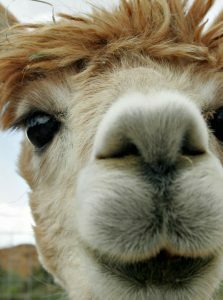 April: Our busy little unplugged WhatsApp group was a-buzz with chat of alpacas, gin and open water swimming (more on that later!). We started creating the #CU18 Spotify playlist (extremely eclectic) and Darren’s alternative Dark and Broody playlist. Unpluggers were meeting up at conferences and relentlessly promoting the event. We kicked off our shiny new subscribers’ email and it’s still going strong – make sure you sign up for future event news. 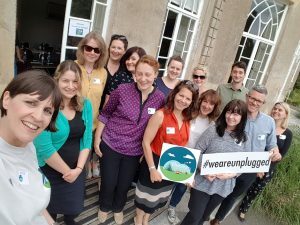 May: One of our fab original #unpluggers Emma Northcote blogged about overcoming her doubts and taking the plunge into the Comms Unplugged world. This is also the month when Harriet Small first got in touch on Twitter to find out if it was worth making the trek to the field. She’s now one of our staunchest advocates! We planned and promoted our first unplugged taster event, working with the Government Communications Service southwest. And we joined #CIPRchat for Mental Health Awareness Week to talk about improving our wellbeing. June: We ran our very first Comms Unplugged taster event at the beautiful Upton Country Park in Poole attended by colleagues from across public sector and charity comms teams. We were delighted that several of them bought tickets for the main event as a result. We announced more speakers, including artist Philippa Stanton and gin guru Robert Holloway of Conker Gin. 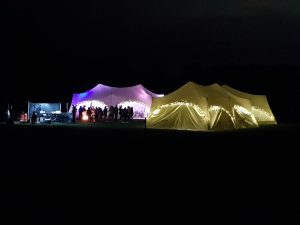 September: Our big month, when we welcomed around 80 people (including speakers and activity leads) to the Comms Unplugged experience in our beautiful field in Dorset. Of course we had to do a 12 day countdown (starting with this one) featuring videos of some lovely unpluggers! Then it was all about inspiring speakers, relaxing wellbeing activities, scrumptious food, epic fireside chat, talented musicians, mixing cocktails, star-gazing, beach-combing, making friends, charity fund-raising, getting back to basics and absolutely NO social media. Bliss! October: Lots of folk blogged about their experience after leaving the field. A new #CU18 WhatsApp group was started and was buzzing with chat, friendship and mutual support. A #CU18 special featured on the Talking Comms Podcast (yes, we did persuade Adrian to join us in the field). The wonderful Alive With Ideas brought to life Darren’s Comms Unplugged in Numbers with a fabulous infographic. We quickly rustled up our entry for several Comms2point0 Unawards. And on World Mental Health Day we announced our 2019 dates (5-7 September) – because, yes, we had already booked the field! November: We revisited the 5 steps to wellbeing for Stress Awareness Week and our ace sponsors Fresh Air Fridays encouraged everyone to get outside and explore. We were touting for votes for Best Team in the Unawards and also found we’d been shortlisted in THREE categories – amazing! Georgia made the case for digital detox in a ‘balloon debate’ at Voice Live 18 in London – she won the vote, of course! 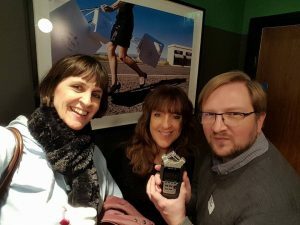 December: The Dorset contingent of #teamunplugged headed up to sparkly, exciting Brum for the brilliant Darren Caveney’s Comms2Point0 Unawards. Loads of unpluggers joined us there for a fantastic stay that included curry, sleeping in the ‘girls’ dorm’, lots of hugs and chat, Die Hard (yes, it IS a Christmas movie!) and – best of all – a win for Best Small Team and Highly Commended for Best Creative Comms! 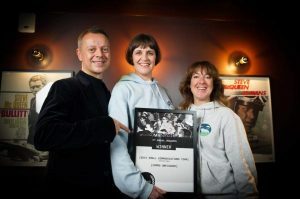 So pleased and proud to be recognised for the event we love so much. It was also an opportunity to rope the unpluggers into a pre-Christmas promo (of course) – Twas the Night Before Burnbake, a customised take on the festive classic. Comms Unplugged 2019 takes place 5-7 September. Sign up to our newsletter for all the latest on speakers and tickets.